List of scorers: Godfred Saka 4, Emmanuel Allan 1, Samuel Asiedu 1, Daniel Gozar 1. * I’ve not been impressed with Aduana Stars FC so far this season. Seven goals in 12 matches is extremely poor and it’s symptomatic that the talented Richard Arhin (born 09.11.1991), often played as a lone striker, still is chasing his first goal of the season. Arhin is a product of the well-run Red Bull Academy. The top scorer and most impressive player of the team is arguably right-back Godfred Saka (born 02.11.1988), a burly, modern full-back with extreme qualities and a wonderful right-foot. Saka is the top scorer of the team, primarily because of his expertise from set-pieces. There are few surprises at Aduana Stars FC. The side is still relying heavily on the experienced trio of Johnson Adomah (born 05.06.1985), Emmanuel Akuoko and Samuel Asiedu (born 27.11.1980). Hard-working midfielder Anthony Tawiah has been a bright spot and defensive midfielder Ebenezer Otu Tetteh (born 08.03.1991) looks promising. I’m still trying to figure out whether Prince Appiah is the same “Prince Appiah” that made headlines for Eleven Wise FC in the GLO Premier League 2009-2010. List of scorers: Ahmed Touré 6, Nathaniel Asamoah 5, Michael Akuffo 2, Daniel Nii Adjei 1, Michael Anaba 1, Iddrisu Nafiu 1, Fatau Mohammed 1. * There are several players at Kotoko that is knocking on the door of the Ghana national football team, including hard-working midfielder Michael Akuffo (born 18.12.1985), right-winger / striker Nathaniel Asamoah (born 22.02.1990), strong centre-back Mohammed Awal (born 01.05.1988), left-back prodigy Abdul Rahman Baba, right-back Yaw Frimpong (born 04.12.1986) and central midfielder Mohammed Yahaya (born 17.12.1988). Football fans will perhaps remember Yahaya from his unsuccsesful stint at French outfit OGC Nice. I’ve read the following accurate description of the player: “His mobility, ability to win balls, distribution and an appetite to shoot on sight made him stand out.” The picture is of Michael Akuffo and is taken from Kickoff.com. From my point of view, captain Henry Ohene Brenya (born 04.05.1985) is somewhat of a unsong hero at the team. Brenya, a intelligent central defender, has been ever-present so far this season. Kofi Nti Boakye (born 05.04.1987) was a high-profile signing before the season but the striker has only played three matches so far. Central midfielder Frank Boateng (born 17.08.1984), right-back Amos Frimpong, striker Iddrisu Nafiu (born 12.06.1986) and defender Mohammed Sabato (born 24.12.1989) have all had dissapointing seasons. I find it amazing that a quality player like Sabato still has not played a single minute of football this season, despite being injury-free. On the positive note, Michael Anaba (born 05.12.1988), a newly signed attacking midfielder, and the lively midfielder David Ofei (born 07.06.1989) have been better then I had expected. Ofei was out in the cold last season but has battles his way into the first team, playing 10 of the 12 matches. 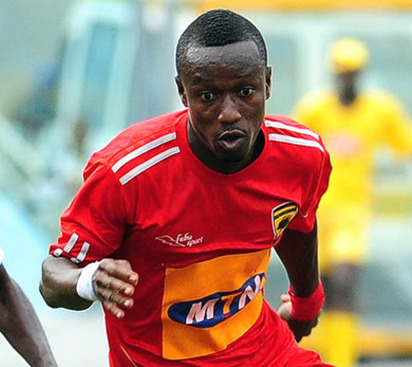 It seems likely that star player Ahmed Touré (born 17.07.1987) will leave Kotoko during the mid-season transfer window. He has apparently spent some time at Egyptian side Al-Masry. List of scorers: Aaron Amoah 3, Yakubu Mohammed 3, Didier Florent Guibihi Koré 2, Moussa Kassé 1, Aminu Mohammed 1. * I’ve been very dissapointed with AshantiGold SC this season. One would assume that a team consisting of brilliant goalkeeper Fatau Dauda (born 06.04.1985), left-back Kwadwo Boateng, right-back Henri Traoré, central defenders John Ashong (born 02.11.1981), Daniel Asamoah and Henry Entsir (born 07.09.1990) – and a midfield constisting of Malik Akowuah (born 19.04.1990), wonderboy Aaron Amoah (born 07.07.1993) and the cultured Aminu Mohammed (born 21.05.1989) should have enough quality. However – the problem has been the team’s attack. Strong centre forward Yakubu Mohammed (born 26.07.1990) and the lanky Ivorian Didier Florent Guibihi Koré (born 17.04.1989) has not scored regularly. I’m a big fan of the wingers Latif Mohammed (born 22.10.1990) and Abdul Aziz Yusuf (born 10.11.1991). David Telfer (born 01.12.1988), a quality holding midfielder, will apparently return to the club for the second part of the season. It seems certain that AshGold will sign a new striker during January 2012. List of scorers: Richard Addai 4, Peter Essien 3, Eric Fordjour 1, Peter Ofori-Quaye 1. * In my opinion, lowly Bechem United FC does not look too bad. There are several interesting players at the team, Princebell Addico (born 1994) being a personal favorite. Addico is a lanky central midfielder or central defender. Central defender Bismark Yaw Osei, right-winger Peter Essien and left-back Rashid Abdul are definitely good enough for this level. In Richard Addai (born 27.07.1986), the club has an experienced frontman who knows what it’s all about. List of scorers: Stephen Amankwah 3, Jafar Danjuma 2, Akwasi Acheampong 1, Prince Amponsah 1, Enock Asare 1, James Boadu 1, Joseph Masel 1. * I am pretty sure that Prince Amponsah is the same “Prince Amponsah” that starred at the midfield of Asante Kotoko FC between 2007 and 2010, born 23.04.1988. Amponsah has played the four last matches for Arsenal and I think he will be important during the second part of the season. Star striker James Boadu (born 24.01.1985) has only scored once – despite being ever-present. I expect much more from the strong winger Bennett Ofori (born 10.03.1989) and creative midfielder Richard Osei Bonsu (born 18.07.1990). John Afrifa (born 03.12.1993) has been a revelation in central defence. List of scorers: Emmanuel Clottey 6, Mohammed Abdul Basit 4, Awudu Moro 2, Yaw Alexander 1, Mohammed Mussa 1. * Chelsea is, just like their English namesakes, rotating their team a lot. Only midfielder Solomon Asante (born 06.03.1987), captain Mohammed Abdul Basit (born 19.01.1986) and star striker Emmanuel Clottey (born 30.08.1987) has played 10 or more matches. Nurudeen Ali (born 16.05.1991) has been a flop and could be heading back to Aduana Stars FC on loan. Expectations were high regarding Gladson Awako (born 31.12.1990) but the petit midfielder has yet to impress. Interestingly, defender Kweku Andoh (born 16.10.1990) and midfielder Isaac Morgan, who joined Chelsea from Heart of Lions FC together with Awako, seems to be miles away from the first team. Perhaps the level at Heart of Lions FC is considerably lower than at Chelsea? Nana Poku (born 01.09.1988), last season’s top scorer in the GLO Premier League, looks like a shadow of himself. Charles Taylor (born 14.07.1981), another big signing, has struggled with injuries and has only played once. In other words, as far as I can tell, Chelsea has not hit the bullseye with one of their new signings, perhaps with Solomon Asante as the exception. List of scorers: Seidu Bansi 6, John Arthur 2, Kwame Asimeng Frimpong 2, Own Goals 1. * Dwarfs looks very solid this season and I think the secret behind the success is the hard-working collective of the team and the remarkable consistency of the following 11 players who all have more or less cemented their place in the team: Foli Adade (GK), Abdul Razak (DR), Rashid Sumaila (DC), Stephen Aidoo (DC), Patrick Cole (DL), John Arthur (ML), Kwame Asimeng Frimpong (MC), Richard Nyanful (MC), Michael Amissah Insaidoo (MR), Bismark Asiedu (FC) and Seidu Bansi (FC). Interestingly, only John Arthur is a new signing and all the other players played regularly last season as well. The players know eachother well and work hard for eachother, making Dwarfs a tough opponent and a candidate for silverware this season. List of scorers: Benjamin Fadi 3, Gilbert Fiamenyoh 3, Godfred Asante 1, Daniel Kofi Bonsu 1, Bright Nsiah 1. * Lions has an interesting mix of inexperienced youngsters and players who’s been around for some time. The experienced midfield trio of Emmanuel Anarfi (born 18.10.1986), Godfred Asante (born 24.07.1988) and Ofosu Amoah (born 25.12.1984) are usually the first names on the team sheet. The star player of the team is arguably Gilbert Fiamenyoh (born 06.07.1992). The burly centre forward is strongly linked to Hearts of Oak SC and it seems uncertain whether he will stay for the second part of the season. Youngster Benjamin Fadi has been a revelation up front but he will definitely be needing support. Somewhat surprisingly, hard-working midfielder Isaac Donkor (born 16.11.1991) has not been able to break into the team after his transfer from Liberty Professionals FC. Can you reply on my e-mail sended to you regarding players? and also to friend request on fb?